Skype is a fantastic tool to stay in touch with friends and family or for business calls. Skype has one of the most robust tools for online conference calls, bringing people together everywhere in the world – when it works as it should, that is. Too often, when video chatting with Skype the video is jerky and blocky and the audio sounds like the other person is talking from the Moon. Worse still, is when Skype calls get dropped mid-conversation or they don’t even connect and you get the dreaded “call failed” notification. 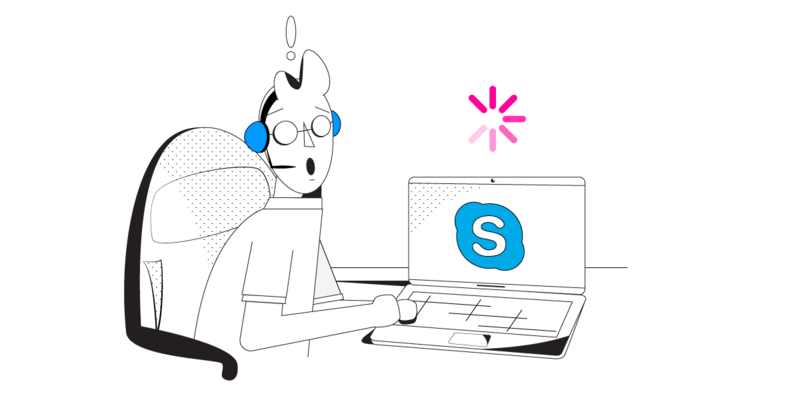 Lucky for you there’s a quick and easy solution for Skype calls dropping or disconnecting. Keep reading as we shed more light on the causes and how to fix this. Why does Skype disconnect calls frequently? Skype video (and even audio) calls are extremely bandwidth-hungry and demand a lot from your Internet connection to work properly. So, when determining why your Skype calls get dropped, you should first look at your Internet connection. It might be that your Internet connection is too slow and doesn’t have enough bandwidth for a VoIP HD video call, or that the connection is flaky and experiencing a lot of “packets loss.” Both of these issues are amplified when you are on the move, since mobile devices can not easily transition between different Wi-Fi networks or cell towers without interrupting apps and dropping Internet VoIP calls, such as the ones on Skype. Regardless of what causes your issues, you should know that by default mobile devices are designed to only use one Internet connection at a time, despite the fact that they are often connected to both Wi-Fi and mobile data. Wouldn’t it be nice if you could be able to use both Wi-Fi and mobile data for speed and reliability? Speedify is a secure no-log VPN for mobility service that changes the way your mobile device connects to the Internet. Instead of just using one connection, Speedify allows your mobile device to connect to the Internet over both Wi-Fi and mobile data simultaneously. This instantly increases your connection bandwidth and reliability and provides a better and “dropping-free” Skype call experience so you always have the best video quality on calls and don’t ever drop any calls. Speedify also monitors the quality of your Internet connections. When it detects that a signal is weak or that the network is too slow, it will automatically and seamlessly reroute the data through the other working connection. Best of all, when the other connection is back online and reliable, it begins using it again – automatically and in the background. Say goodbye to Skype calls dropping! In addition to delivering a faster Internet experience to your mobile device, Speedify uses cutting-edge technology to quickly encrypt all the data sent to and from your device. Speedify keeps you safe from compromised Wi-Fi networks, snooping ISPs, and other threats and was designed to have zero impact on your devices battery life. It is also smart enough to try and send as much data as possible through Wi-Fi instead of over more expensive mobile data connections – saving you from potential overage fees from your carrier! Plus – you’ll have the peace of mind that your company’s sensitive data will not get into the wrong hands when delivering presentations. Skype calls can be tricky, to say the least, when you’re on the move or don’t have the “brightest” Internet connection. But Speedify has your back covered. Get started with Speedify now for FREE – no strings attached no email sign-up necessary!